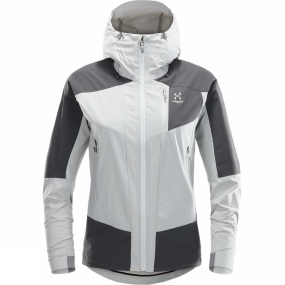 The Womens Skarn Hybrid Jacket from Haglof gives an excellent mix of element resistance and comfort in this hybrid softshell jacket, keeping you warm and dry while remaining breathable. The fluorocarbon-free DWR adds more protection. There's space for items in the strategically-placed pockets, and the hood won't interfere with your helmet.